The Curtiss 18T, unofficially known as the Wasp and by the United States Navy as the Kirkham, was an early American triplane fighter aircraft designed by Curtiss Engineering for the US Navy. The Curtiss 18T was intended to protect bombing squads along the French coast, and a primary requisite for this job was speed. Speed was not the triplane's only salient feature: an 18T-2 set a new altitude record in 1919 of 34,910 ft (10,640 m). The streamlined and very "clean" fuselage contribiuted to the aircraft's performance. The basic construction was based on cross-laminated strips of wood veneer formed on a mold and attached to the inner structure. The technique was a refinement of that used on the big Curtiss flying boats. Flown by Roland Rholfs, the 18T achieved a world speed record of 163 mph (262 km/h) in August 1918 carrying a full military load of 1,076 lb (488 kg). The Model 18T-2 was an improved version of its predecessor, boosting 50 additional horsepower. The wings of the new model were swept back. It was also 5 ft (150 cm) longer with a 9 ft (270 cm) longer two-bay wing, though its flight ceiling was 2,000 ft (610 m) lower. After World War I, it was employed as a racing plane: an 18T-2 nearly won the Curtiss Marine Trophy Race in 1922 (limited to U.S. Navy pilots), but pilot Sandy Sanderson ran out of fuel just before the finish line. Curtiss Engineering followed the success of the Model 18T with the launch of the Model 18B, unofficially known as the "Hornet", built to otherwise similar specifications. Model 18T or 18T-1 Two-seat fighter triplane with single-bay wings, powered by a 400-hp (298-kW) Curtiss-Kirkham K-12 piston engine. Referred to by the US Navy as the "Kirkham". Originally designated 18T, the type was redesignated the 18T-1 when the prototype was modified to a new configuration designated 18T-2 (see below). 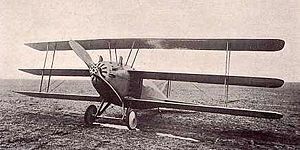 Model 18T-2 18T with longer-span two-bay wings. Could be fitted with floatplane or landplane landing gear. Model 18B Biplane fighter version, known unofficially as the "Hornet". "The Curtiss Model 18-T Triplane." Flight, Volume XI, Issue 22, No. 544, 29 May 1919, pp. 698-700. "The Curtiss Model 18-B Biplane." Volume XI, Issue 28, No. 550, 10 July 1919, pp. 902-904. Green, William and Gordon Swanborough. The Complete Book of Fighters. New York: Salamander, 1994. ISBN 0-8317-3939-8.